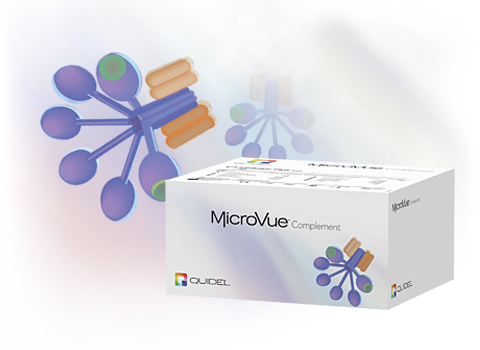 The MicroVue Bb Plus EIA measures the amount of Bb present in human plasma and serum. Because Factor B is unique to the alternative complement pathway, Bb is an excellent marker for alternative pathway activation. The alternative complement pathway provides innate protection against microbial agents in the absence of specific antibody. The activation of this complement pathway can be triggered by a variety of different chemical moieties and substances including LPS, bacterial lipids and polysaccharides, virally infected mammalian cells as well as transformed cancer cells. Centrally important to the alternative pathway is the zymogen Factor B. Factor B is a 93 kD protein which is converted to an active proteolytic enzyme via a two step reaction involving C3b and Factor D. Factor B binds to C3b (or hydrolyzed C3) either in fluid phase or on a membrane or other surface. In the second step, Factor D cleaves the bound Factor B to yield Ba (33 kD) and Bb (60KD) The resulting bimolecular complex is the alternative pathway convertase and is capable of cleaving additional C3 or, together with a second C3b molecule, C5. Since the Bb molecule is unique to the alternative pathway of complement, levels of Bb provide an excellent marker for complement activation via this pathway. Sefton, M.V., et al. Using ELISA to evaluate complement activation by reference biomaterials, J. Mat. Sci, 5:622-627, 1994. Mold, C. Tamerius, J.D., et al. Complement activation during painful crisis in sickle cell anemia, Clinical Immunology and Immunopathology, 70:3,314-320, 1995. Manzi, S. Rairie, J. et al. Sensitivity and Specificity of plasma and urine complement split products as indicators of lupus disease activity, Arthritis and Rheumatism 39(7)1178-1188, 1996. Jarvis, J., Taylor, H. Complement activation and immune complexes in children with polyarticular juvenile rhuematoid arthritis: a longitudinal study, J Rheumatology 21(6)1124-1127, 1994. Aggarwaal, A. et al. Evidence for activation of the alternative complement pathway in patients with juvenile rheumatoid arthritis, Rheumatology 39:189-192, 2000. Buyon, J., Tamerius J. et al. Assessment of Disease activity and impending flare in patients with systemic lupus erythematosis, Arthritis and Rheumatism 35(9)1028-1036, 1992. Shaw, D., Rustagi, P. et al. Effects of Synthetic Oligonucleotides on human complement and coagulation, Biochemical Pharmacol 53(8)1123-1132, 1997.